The Talbot family is in trouble. The business is collapsing, Mum can’t stop crying, and Ella will do anything to help. So when she finds thousands of pounds in Dad’s secret post office box, she thinks that all her problems have been solved. But thousands of pounds lead into six extraordinary rooms, and then Ella’s problems really begin. The money is hers, but she must win it by completing dangerous challenges in unknown places. With only her wits and the mysterious voice of ‘Finder’ to guide her, Ella navigates a pitch-black pathway, entertains evil executives, and escapes from vicious scorbsters. In Dark Rooms, Bored Rooms and Sale Rooms, she passes challenge after challenge, collecting more of the money and giving it to her parents without them knowing its origins. Yet with each conquest, Ella’s goal seems to move further and further away. The money brings new challenges that are much closer to home. She must follow the right path and learn the lessons of loyalty, determination and friendship before it’s too late. How will Ella save her family without Box 1571 destroying everything she has? This is a daydream adventure from R. M. Tudor. Ever since she was a child she wanted to be an author; those dreams have now turned into a reality as her first children's book, which is being published for 8-12 year olds. The author has spent her last nine years teaching and very much utilised that experience towards the development of Box 1571. The seed of this story started with the author both living and working in Australia. One day she had to collect the post for the company that she worked for - this my seem quite an ordinary and everyday task, but she'd never seen a post office box before. This got her thinking as to what might be on the other side. Maybe just like this story, there really might be another world on the other side . . . . . . If you want to find out like I already have, then you NEED to turn those pages. The plot started really quite slowly, in my opinion. The story is narrated by a young girl called Ella, who tells the story of her family struggling with financial problems at their family run cafe. Once this was established, I started to really warm to the fantastical adventure within. 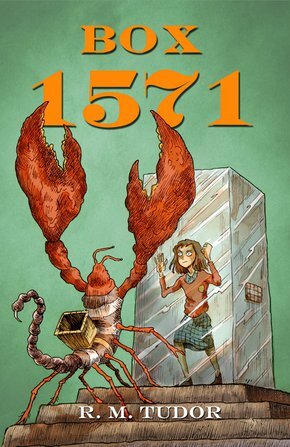 I was really intrigued and transported to a magical world each time that Ella visited Box 1571. The six rooms and adventures were like engrossing Roald Dahl snippets into an alternate world leaving your imagination on over drive. Every visit Ella makes transports you into a crazy and surreal place, especially as the challenges become more bizarre than the next. You will find yourself sucked into the box navigating The Sale Room, a once-in-a-year opportunity to buy everything and anything that you need or, in some cases, don't need! Then the next minute you are being chased down by the fantastically named Scorbsters (lobster/scorpion-type creature) which are all very strange and crazy, but fantastic to read about. This is a very heart-warming story that will have you thinking about daily family life. It's a great family read told with both passion and conviction. This author is a new voice in story telling - I'm really looking forward to reading more by R.M Tudor.